Has it been a little quiet around here lately? There's a good reason for that! It's called complete fatigue and major nausea that comes and goes randomly. I'm currently 12 weeks pregnant and I seriously hope the nausea gets better soon. It wasn't nearly this bad with either of the boys (and yes, about a bajillion people have now told me "well, you must be having a girl"). I've been eating about one good meal a day and then surviving on toast and juice. Hey, helps with the pregnancy weight gain I guess! I knew I was pregnant before the positive test. It's not completely unheard of for me to be late, but very rare. I took 4 tests, one every 3 days starting on the day I was due until I got a positive (the day after my brother's wedding!). In the mean time the first sign I was pregnant? The fact that my dreams suddenly got very vivid and I remembered them. This is a hallmark of pregnancy for me. However. When I did finally get that (oh so faint) second line it went from being an intuitive knowledge to an "oh wow, we really are doing this again" reality. Then the waiting for all the other lovely symptoms to kick in. The I-can't-sleep-on-my-back at all symptom. That started about week 7. The getting-up-in-the-middle-of-the-night-pee; also week 7. The new one this time though? Feeling that twinge when I sit up too fast that is ligaments stretching. I really don't remember that until about 4 months or later... 7 weeks stinks! And today we heard the heartbeat for the very first time. Yay! 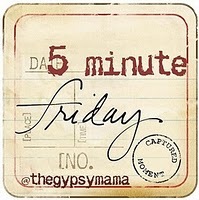 This post was actually pieced together over a few weeks, but I just can't resist the fact that it fits so well with today's 5 Minute Friday theme! Congratulations K and family. May God give you strength and may you get the rest you need. Congrats..now the true insanity begins. Welcome to the club!! Congratulations! How exciting!! Hope the nausea goes away soon. Oh Krista, such wonderful news! Congratulations, and I hope that you begin to feel better soon. Congratulations! I hope your nausea goes away soon! Yeah! I'm so happy for you guys. I'm putting in my vote for a 3rd boy! May God bless you with your very own wolf pack. And yeah, lots of symptoms started early on the third one for me too, and I was way way way more emotional. Also nauseated really early. I remember changing a diaper with a puke bowl beside the baby just in case I hurled. Good times. So you have finally announced it! Congratulations again! I guess the pregnancy symptoms come earlier on subsequent babies, huh. Hope your nausea goes away soon though. It's not fun! Hooray! And congrats! So very excited for you all.